Fading in the final miles is common in the marathon. It can happen anywhere past the half-way point, and is typically a combination of mental and physical fatigue. The typical marathoner will slow down 14% in the last half of the race. To put this in perspective, for a 4 hour marathon, this means 1:52 in the first half and 2:08 in the last half. For a 5 hour marathon, this would be 2:20 in the first half and 2:40 in the last half. "Should I eat gels during a marathon?" We get asked this question frequently. The short answer is: probably! If you've ever hit the wall in a marathon, it's most often due to running out of carb energy. For the typical marathoner, this happens somewhere between mile 18-22. It's caused by depletion of glycogen reserves, stored in the liver and muscles. Hitting the wall makes it very difficult to keep running and most runners slow to a dizzy walk. 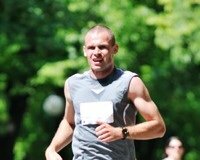 Marathon training exacts an energy toll on the body. Running 4-7 days a week in a solid training plan leaves little time to rest and recover. One of the most important components of a successful training season is proper refueling. This means eating to replace lost energy reserves and for rebuilding and growing for improved fitness. One of the best items to refuel with are fruits. 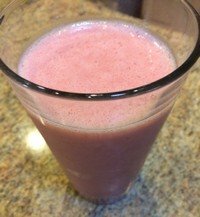 A quick, easy, and satisfying way is with a fruit smoothie. Running 26.2 miles in 4 hours requires a high level of fitness. Fewer than 25% of marathoners have broken the 4 hour barrier. Nearly all of the marathon must be run and a good pace must be maintained throughout. 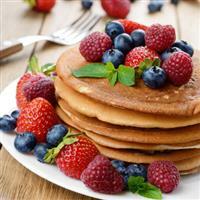 A big stack of pancakes is a delicious carb-fest for us runners. After a long run of 8 or 10 or 12 miles, it's a tasty way to replenish those glycogen stores. Unfortunately, traditional pancakes of white flour, sugar, and fake maple corn syrup aren't the most healthy option for energy replacement. But you can have your pancakes and feel good about eating them too! Here's a handy marathon pacing chart to determine your needed pace in minutes per mile. Pacing is based on the marathon standard distance of 26 miles and 385 yards, or approximately 26.22 miles. Once you've done a marathon or a few, your next goal may be more than just finishing. It can be a fun challenge to set a time goal. Running within a certain time requires good pacing, proper hydration and fueling, and being mentally tough through the ups and downs of 26.2 miles. Blisters and running go hand-in-hand. Or, is that foot-in-foot? Puns aside, blisters can be excruciating. Blisters form on the bottoms and side of the feet and toes, and between the toes. Tight-laced shoes can also cause blisters to form on the top of the feet. The objective of the marathon runner race strategy is to finish a marathon within 5 hours. 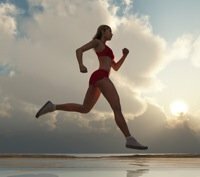 To do this, you'll need to run a majority (75% or more) of the marathon. This is a great strategy for new runners who are adequately prepared, experienced athletes who have had limited preparation, and the slow but steady runners.